Breakaway is a beautifully located holiday home above Nebraska Beach at Dennes Point, on the sunny northern tip of Bruny Island. 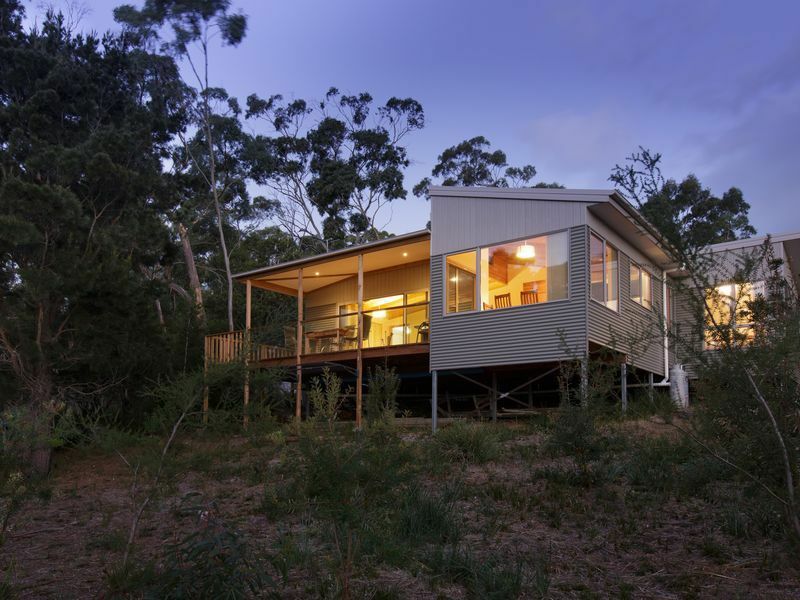 The property sits on a bush block, home to many bird species and the occasional visiting spotted quoll and echidna. Open-plan living areas and vaulted ceilings create an appealing sense of space and light. Double-glazed doors open out to a west-facing covered deck, providing panoramic views of the D’Entrecasteaux Channel. The water and sunset views from here are impressive. Enjoy the warmth from the free-standing wood heater during the cooler days or evenings. The building is well insulated with double glazing, so is quite cosy during winter months. The kitchen is well-equipped for self-catering with some pantry basics and a dining table that seats six. The barbecue and deck are perfect for outdoor dining. The home has three bedrooms, two with queen beds and the third with two singles, so there’s plenty of space for family and friends to stay. Bed linen and towels are provided. There’s a light and bright bathroom, separate toilet, and a washing machine. Nebraska Beach is an excellent beach for safe swimming or rock hopping. Access to the beach is via a private right-of-way to a set of timber stairs, then a few steps across Nebraska Road to the sand. As well as being so close to the beach, the house is within easy walking distance of the Dennes Point Jetty Cafe and Art Gallery. Opening hours vary throughout the year, so check their site for details. Other local facilities include a nearby boat ramp and jetty. We provide tennis racquets and balls for you to use at the local public tennis court. Bruny Island is firmly on the list of Tasmania’s top ‘must-visit’ destinations. Bring your own supplies or enjoy local produce, including berries, cheese, whisky, oysters, and wine. General stores are open 7 days a week at Adventure Bay and Alonnah in Bruny’s south. From Hobart, it’s a 35 minute drive and a 20 minute ferry ride to get to the island. Breakaway is a 25 minute drive from the Roberts Point ferry terminal. Note: Breakaway was built by Mick, a Dennes Point local, in 2012. Mick ran the property as short-term rental accommodation, receiving excellent reviews. Rob & Anita bought the property in September 2017 and have continued to make it available for short-term rental. Tennis rackets and balls are provided, and may be used at the local tennis court, a 5 minute walk away. The house had everything we needed and a welcome guide to help us get our bearings. The beach is lovely and quiet and only a 2 minute walk. We hope to be back someday! We had a fantastic one week stay in this lovely place. The house is clean,spacious,well equipped with beautiful view of trees and sea. Good swimming beach also very near. Just go down the stairs, cross the road and you are there. We had nice walks and observed kangaroos cockatoos and many other animals. Spotted quolls even visited often on our terrace. Watching them was very interesting. Keep your camera ready! We recommend this place without any reservations for people who appreciate nature and tranquility and can live without everyday internet. Great deck to sit on and enjoy the wildlife and views! Thanks for having us. So pleased you saw a spotted quoll and a forty spotted pardalote. The spotted quoll is a frequent visitor, it likes the deck as well! I want this house all to myself so I don’t want to give a good review, haha! The house and the area is just stunning. Very comfy beds and all the mod cons. Close to the beach, lots of wildlife especially at night, we actually saw a spotted quoll! The house was everything we could have asked and more! Immaculately clean, beautiful ocean views. The kitchen is so well equipped. We stayed with 4 adults and were perfectly comfortable (having 2 toilets is great!) but also brilliantly set up for families. I can’t thank Rob and Anita enough! Great accommodation in a lovely spot in Dennes Point. Excellent communication from hosts and super clean and well maintained property. We loved it and hope to come back again soon!